Personalize your new favorite bottle opener with a custom logo or embellishment that fits your unique style! Buy one for yourself or give as a gift. Our Mason cut-out bottle opener is a stainless steel bar key bottle opener with two functional ends. The opener is flat and easily fits in a pocket or can be hung on the wall or refrigerator for convenience. Stainless steel, hand-held flat bottle opener designed to open beverage bottles or cans with metal tops. 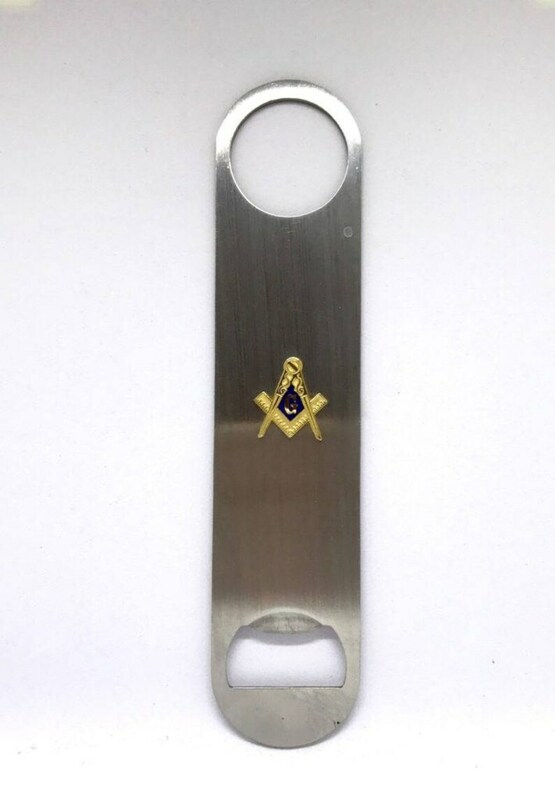 This bottle opener is used by most bartenders for its sturdy nature and durability which makes it a long lasting product. Use the opener to easily pop off any bottle top metal cap or lift the ring pull on typical soft drink or beer cans. The thumb hole will fit easily over a pour spout when lodged in a bottle or allow for pulling bottles from an ice packed container plus it makes a great hanger. Use in the kitchen, on the patio, at a picnic or any location where beverage bottles or cans are being served.